But there are a few outliers to that bipartisan trend. 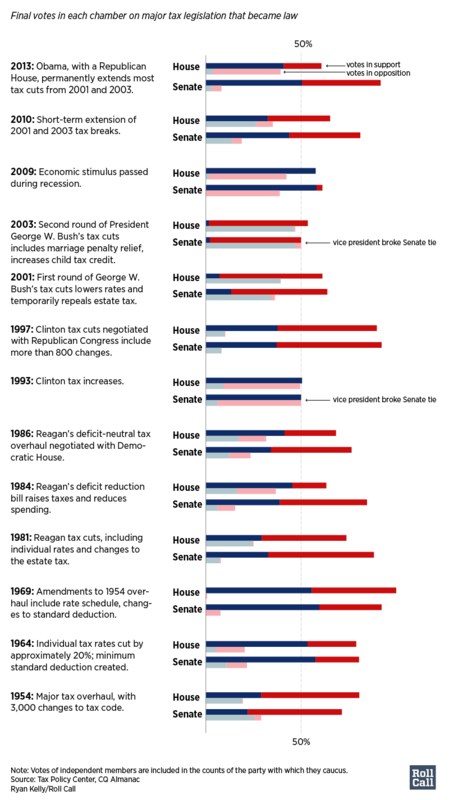 Democrats mostly opposed President George W. Bush’s first round of tax cuts in 2001, accusing Republicans of needlessly squandering the budget surplus inherited from the Clinton years, which they felt resulted from tough partisan votes to raise taxes that cost them their majority. When Bush pushed for a second round of tax cuts two years later, Democrats pointed to the return of deficits and the cost of fighting two wars, and forced Republicans to find the needed votes on their own. The GOP opposed President Barack Obama’s 2009 stimulus bill, which included both tax cuts and Keynesian spending measures in an effort to respond to the housing crisis that had crippled the economy and sent it spiraling into a recession. But bills in 2010 and 2013 to extend Bush’s tax cuts (while increasing the debt limit and ending cuts for the wealthy) saw both parties agree. Annual budget deficits, though, are now increasing along with mandatory and defense spending, at the expense of non-discretionary appropriations favored by Democrats and adding to a national debt of nearly $21 trillion. With few conservative Democrats left in Congress, historically low levels of public support for Trump and provisions in the bill that would make their constituents bear the costs of the cuts and further cripple Obama’s signature health care law, the minority has made it clear that Republicans will have to go it alone on the cuts under consideration now. The House bill passed, 227-205, with 13 Republicans, most from blue states, joining all Democrats in opposition.